Robert Galloway and Nathaniel Lammons also attended the CONCACAF Champions League semi-final. Former World No. 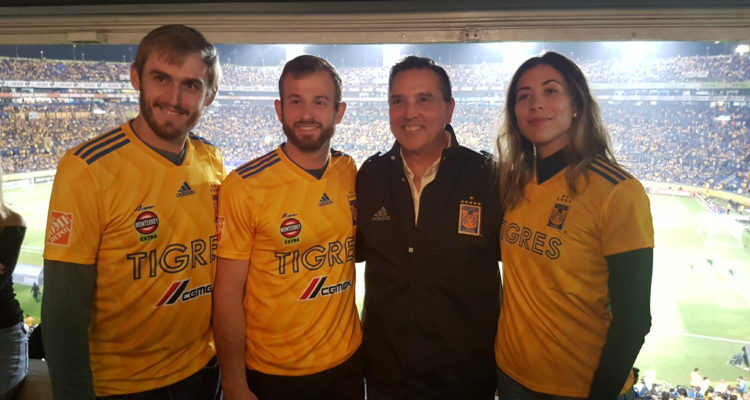 1 Garbiñe Muguruza took some time out to visit the CONCACAF Champions League semi-final football match between UANL Tigres and Santos Laguna at the Estadio Universitario on Wednesday evening. Following her triumph last year, the 25-year-old Spaniard, who was born in Venezuela, is seeking her second title at the GNP Seguros Open in Monterrey, Mexico this week. Muguruza was joined by US-Americans Robert Galloway and Nathaniel Lammons, who are seeded third in the ATP Challenger doubles draw. Tigres won the match 3-0. This entry was posted in WTA Tour News and tagged Abierto GNP Seguros, ATP Challenger Tour, Monterrey, WTA.